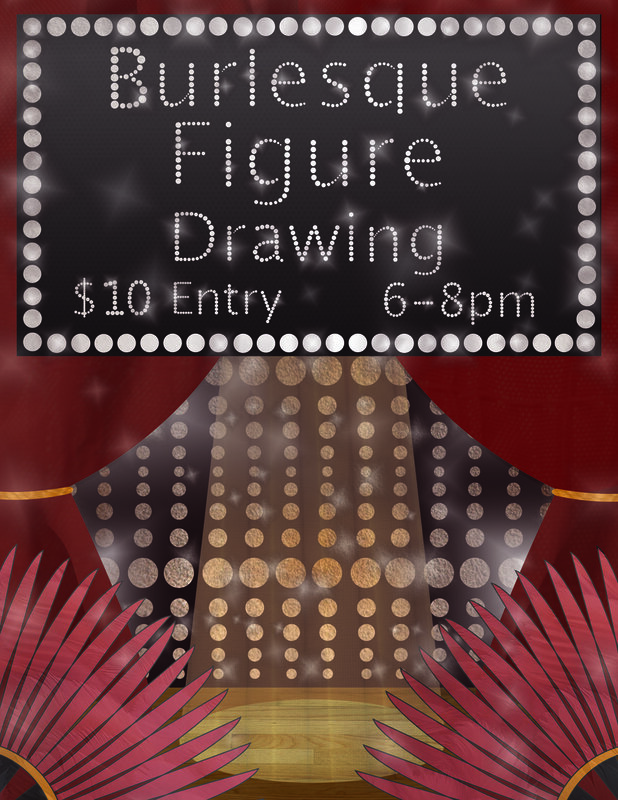 Join us for the Gallery's very first Burlesque Figure Drawing. We're trying something new and different and have decided to incorporate a fun yet casual Burlesque style figure drawing. We have a model confirmed and we're ready to go with fun backdrop and small stage. Curtains drawn, we're asking artists to be 17 + . Admission to join in is $10.00 at the door, cash or credit is accepted and it's a BYOM (Bring your own materials.) We will have space for 8 high chairs with table, and available will be 10 table easels. Otherwise we want artists to bring their choice of pad, paper, oil, pastel, charcoal you name it we can't wait to see what is created. We're also open to anyone who does digital paintings and would like to bring in their tablet or laptop. We will be adding a small list of etiquette for artists in front of a Burlesque model. Otherwise, we're in a fun, positive environment and we all just want to CREATE! Reach out to itsapeaceofartgallery@gmail.com with any questions or concerns. First one begins September 6th at 6 pm prompt until 8 pm. Get here a bit early to cruise the gallery and find your seat and set up! Will be going into detail per event soon. Stay tuned - but let's give a warm welcome to September! Belief Becomes is the product of a personal challenge to create spontaneous works of art. Using a limited palette and lots of water, abstract images manifested into forms that suggest worlds both natural and ethereal. I created my paintings in mostly one session which focused my attention and intuition. With a literal call to my muse, I approached each image with trust. My belief is that, though I am not solely responsible for what becomes, guiding the flow will lead to elegant forms that are new yet familiar.